Director Michael Paul was kind enough to take some time to chat with us about what it was like filming his first feature. Read below for our interview with this talented up and coming filmmaker. First, thank you so much for taking the time to chat with us. For those who may be unfamiliar with you, can you tell us a little about yourself? Sure Troy, thanks for having us! This is Anne’s and my first feature film, so people will not yet know us from previous projects. My undergraduate degree is in film and animation and spent the 1990s in video game development back in Chicago before working in LA as a visual effects artist. My wife Anne, who wrote, produced and ultimately starred in Roman’s Bride comes from marketing and has an extensive writing and acting background from Second City in Chicago. How did Roman’s Bride come about? Anne and I have always been passionate about films and talked for years about producing our own. When we left LA for a large wooded farm in the Midwest we suddenly had our own personal back lot and figured it was now or never. It was a long process of putting a team together to make it happen, but once we got the ball rolling it really never stopped until it was done, which was fantastic. We were both working full time and I was getting my masters degree at the time so production was definitely a long slog. How did you go about securing the budget for the film? The film was completely self-funded. Which simultaneously is a blessing and a curse. One, it’s your money which makes it your movie and eliminates a whole lot of stress involved with gambling someone else’s money. If you screw everything up, your rich uncle will still speak to you. The downside is you obviously don’t have as much money to play with, but with Anne writing the script, she knew what we had and what we didn’t and focused on writing a story that we could shoot within our means. This also meant however that production would take a very long time. Ultimately it took 3yrs for us to make Roman’s Bride. Your wife, Anne, portrays the main character of Lily in the film. What was it like directing her, particularly since Roman’s Bride is the first feature film for both of you? How did you assist her with getting into character? The original goal was never to make something with Anne as the star. That actually came about due to the self-financing. It was a strategic move to take best advantage of our resources. Our smallest scene could consist of one person behind the camera and one in front. It gave us tremendous flexibility in scheduling and kept our expenses down. It also allowed us greater opportunity to focus on getting inside Lily’s psyche and explore her as a character. Who Lily came to be is entirely Anne’s creation, from writing the character to internalizing her world on camera. I did my best to capture what Anne had for me, and give the support she needed to find that character within her. For many of the scenes that involved Lily with the rest of our cast, Anne and I shot her character separately on an entirely different day whenever possible. That way we would have Anne as a resource behind the scenes when we had others on camera and shooting in this manner also emotionally helped build Lily’s isolation from the other characters in the film. How was the rest of the cast secured? We knew as first time filmmakers without a budget, the task of recruiting talent without a prior relationship would be difficult. Anne, was our casting Queen and focused on enthusiasm over existing experience. We knew early on this was going to be a long production and we needed people on our team that could sustain the long-term commitment without losing their energy for the project. The risk you run when you don’t have money for a cast is getting caught depending on someone who loses interest long before you are done with production. Any memorable or interesting stories from filming that you can share? Anne doesn’t find this one too funny because she spent hours cleaning it up, but the car that Gary and Lindsey are in when they’re attacked was a rental Anne had snagged from the airport. After the day’s shoot we drove the car to the carwash in town to try to get it cleaned up. You definitely get some unsettled stares from people when you pull into a car wash with blood splattered windows and you’re vacuuming out shattered glass and scrubbing the upholstery like you’re hiding a crime scene. We were, but from the rental company, not the cops. For me, your passion for the horror genre is palpable throughout Roman’s Bride. What are some of your favorite horror films and/or films that you feel influenced your style? Anne and I have different individual influences when it comes to films but where we crossover are 60s and 70s era horrors. The good ones are slower paced and focus on building a world and characters before you tear it down. The Shining and Carrie obviously influenced Roman’s Bride. We wanted to create a complicated yet damaged character that you couldn’t help but identify with despite the horrors they were responsible for. As Kubrick famously made the Overlook Hotel a character in of itself, we also wanted to use Iowa as a character, capturing rural isolation without the cliché silo and endless flatland that you normally associate with farm life shot by someone who isn’t from it. Anne and I are originally from small rural communities so we both felt that strongly. Lily never escaped and saw an outside world, therefore she struggles when the one she knows begins to change. Why should horror fans see Roman’s Bride? Unexpectedly we’ve had a tremendous audience with female fans, which I have to attribute to Anne’s portrayal of Lily. So guys out there, here’s a horror film you can drag your slasher-hating girlfriend to. There’s blood and torment for you to enjoy, but at the hands of someone who just wants to be loved. Granted it may give your wife or girlfriend ideas on how to express her frustrations more, but as long as you aren’t a dirty sinner you should probably be fine. What’s next for you? Any upcoming projects? So glad you asked! Actually Anne and I are already in the middle of production on another film, a horror comedy that we hope to start talking about more in the coming months. Based on the success of Roman’s Bride, we’ve gotten a great deal of support in tackling something with a much larger cast. We’re 20 days of shooting into it and expect photography should be complete by early summer. Post we be a lot longer, but right now we’re hoping for a 2013 release. We’re very excited about it, and can’t wait to start sharing what we’ve been doing as we get closer. Absolutely! 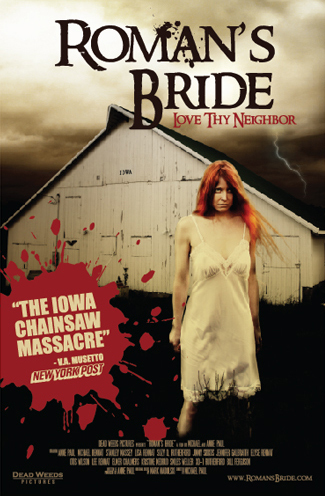 For anyone looking for something the New York Post called, “The Iowa Chainsaw Massacre,” for their next movie night, Roman’s Bride is out now on DVD and is available through http://www.romansbride.com. Your girlfriend will love you for it! Thanks so much Troy!